Tru Funk Posse, the little known teen hip hoppers from Bristol, which consisted of Jody Wisternoff and his younger brother was a bit of a phenomenon back when they were using what was then, state-of-the-art production equipment. After years of swiveling within the hiphop genre, Jody met up with Nick Warren, another Bristolian who was well into a different side of things, a more dancey house influenced side which saw an interesting start to one of the most dynamic and innovative producers today. What some consider as a fusion between breakbeat, trance and house, and others consider to be classical electro dance music, whatever it is, Jody and Nick and their Way Out West guise have been tearing the boundaries for almost 10 years now. 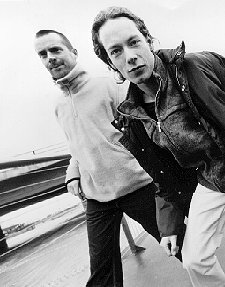 In 2003, they have an upcoming album set for a release containing some of the unreleased and new material, so look forward to some more massive WoW soon!